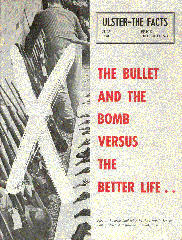 The following pamphlet was published by the Ulster Unionist Party in 1970. The views expressed in this publication do not necessarily reflect the views of the members of the CAIN Project. The CAIN Project would welcome other material which meets our guidelines for contributions. These extracts are included on the CAIN site by permission of the publishers. You may not edit, adapt, or redistribute changed versions of this for other than your personal use without the express written permission of the publishers, Ulster Unionist Party. Redistribution for commercial purposes is not permitted. "We are determined to rid Northern Ireland of the terrorists in our midst." 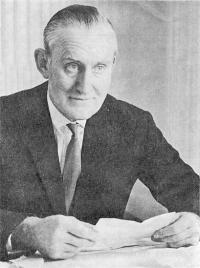 With these words, in a television broadcast to the people of Ulster on Saturday, July 4, 1970, the Prime Minister, Major James Chichester-Clark, pledged his Government’s resolve — and reflected the desire of the vast majority of the population — to stamp out the violence and destruction which had kept the Province living on its nerves for more than 18 months. His dramatic broadcast came at the end of a week in which at least nine people were killed and over 400 injured in the streets of Belfast . . . and only hours after 3,000 troops, in a massive arms search of the city’s Lower Falls area, flushed out a frightening arsenal of more than 100 weapons, half a hundred weight of gelignite and over 21,000 rounds of ammunition. The new wave of rioting erupted within hours of M.P. Bernadette Devlin’s arrest on Friday, June 26, after she had failed in a bid to take her appeal against a six-months prison sentence for her part in last year’s Bogside disturbances to the House of Lords. She was arrested within the jurisdiction of the magistracy in which the offence was committed, while she was on her way to address a final meeting of her supporters in Londonderry (which is not in her constituency) and after the Northern Ireland Appeal Court judges had found there were no points of evidence or law which would enable her to take her case to the Lords. Yet her imprisonment was used by Republican elements as an excuse for the two week-ends of misery which followed. "That is politicians’ law, not judges’ law, and those who advocate it would be the first to complain if it ever operated against them. . . . If her address had set off fighting and if Miss Devlin, even against her will, had been spirited across the border, who is to say that the consequent rioting and communal distrust would have been any less than what happened this week? It takes much self-confidence to pontificate on these matters." Friday night. June 26 — The Bogside blazes again. Ninety-two soldiers are hurt in the clashes as 141 petrol bombs are thrown and 24 people are arrested. Saturday, June 27 — Five men die and scores of people are injured during fierce gun battles in Belfast’s worst rioting since the previous August. Many buildings are burned and looted as troops and police fight off attacks from rioters. The violence flares when an Orange parade — taking place with the permission and under the protection of security authorities and on a route approved by them — is attacked. It continues at intervals until dawn on Sunday. The casualty figures are staggering: of the 58 civilians with gunshot wounds, five men die and 48 are admitted to hospital. Eight people have CS gas injuries and 95 others are treated for various in juries. Casualties in the police and Army ranks are lighter but over 40 policemen are injured and four soldiers receive gunshot wounds. Seven others are admitted to hospital and about 40 soldiers receive minor injuries. The old trouble spots of Ballymurphy, Crumlin Road and North Queen Street are once again the battlegrounds. But the worst shooting incidents take place in East Belfast. On Newtownards Road there is sporadic gunfire from midnight until daybreak in the area’s blackest night since the wartime air raids. Earlier, in what police call "a pre-arranged plan," arson attempts are made on large city-centre stores. Sophisticated battery devices are used to start some of the fires. Tennent Street Royal Ulster Constabulary Station, w h i c h houses both police and troops, is besieged by a mob who also set fire to an off-licence and a tyre firm. Then the Army opens fire on snipers in the street. A Roman Catholic hotel owner, who refuses to give bottles for ammunition to a mob of Roman Catholic youths, stands by helpless as his hotel is plundered and burned to a shell. By morning the total amount of CS gas used by troops is the biggest ever — 264 grenades and 1,331 cartridges. The situation gets so desperate that the Army opens fire with machine guns from armoured cars over the heads of the burning, looting, wrecking mobs. Firemen, some of whom are shot at, cannot reach many of the 100 fires reported in the city. The "Belfast Telegraph" reports later: "The heaviest shooting came from St. Matthew’s R.C. Church and also in the Seaforde Street area." The "Sunday News" reports: "Two snipers with heavy calibre rifles were firing from the belfry of St. Matthew’s Church." Sunday, June 28 — Two soldiers are wounded by gunshots on Springfield Road, only a few hours after troops again use tear gas to quell violence in East Belfast and Ballymurphy. An oil warehouse is damaged by fire after an explosion. Andersonstown police station is besieged by a mob and its windows smashed. Today’s troubles start when troops are twice showered with stones and bottles by crowds in Ballymurphy. The "Belfast Telegraph" later refers to reports of a sniper in the tower of St. Matthew’s Roman Catholic Church, Newtownards Road. The General Officer Commanding Northern Ireland, General Sir Ian Freeland, warns that anyone seen carrying or using f ire-arms will be shot without warning. And the Cabinet Security Committee announces that the Ulster Defence Regiment is helping the Army and R.U.C. to guard key points and patrol the border. Renewed rioting in Londonderry, with more than 100 troops injured in the vicious fighting since Saturday afternoon, as the tricolour, symbol of a United Ireland, flies from a high block of flats. Many Protestant families move out of Belfast’s New Barnsley estate. Rev. Cecil Courtney, minister of Springfield Presbyterian Church, says many more want to leave the area and will be evacuated. Troop reinforcements are flown in as arms searches begin. And the Prime Minister says in a statement: "In the activities of gunmen and the carefully-planned incendiarism there is clear evidence that there are people involved in this rioting who want to destroy Northern Ireland." Monday, June 29 — The death toll for the weekend gun battles rises to six when a Roman Catholic man dies from his injuries. The other victims are all identified as Protestants, shot in East Belfast and Crumlin Road. For the fourth night in succession troops in Belfast use CS gas to disperse rioters at Ballymurphy. Trouble also breaks out again on Newtownards Road and in Londonderry’s Bogside. Ballymurphy housewives form a human chain across the junction of Springfield and Whiterock Roads to try to prevent youths attacking troops. Tuesday, June 30 — Stormont M.P.s sit all night to rush through emergency legislation imposing stiff mandatory jail terms on rioters and other troublemakers and ‘introducing anti-incitement penalties as Home Secretary Mr. Maudling flies in. Wednesday, July 1 — Another Orange parade is attacked. Mobs stone Orangemen in Coalisland, County Tyrone, as fire-raisers destroy the town’s main factory. Police baton-charge the rioters and then troops use gas to disperse them. A wedding party is attacked by a tricolour-waving crowd at Drew Memorial Church of Ireland, on Belfast’s Grosvenor Road. Home Secretary Mr. Maudling, at a news conference before returning to London, pledges no change of policy towards Northern Ireland and full support for the Ulster Government, praises police and Army. Priemier Major ChichesterClark tells Parliament: "I am convinced that the violence was originated and exploited by disciplined subversive elements working to overthrow the State." Thursday, July 2 — A bomb-blast wrecks the Army information and recruiting centre in York Street, Belfast. Lord Balniel, Minister of State for Defence, flies to Northern Ireland on a fact-finding visit. Another battery-operated bomb is found in a downtown store. Development Minister Mr. Brian ‘Faulkner says the incidents point to a conspiracy. The "Daily Mirror" reports that teams of London detectives, in a series of dawn swoops, have captured an I.R.A. arsenal of machine-guns, rifles and thousands of rounds of ammunition intended for Ulster. Several arrests are made. Friday, July 3 — Troops move in to seal off 13 streets in Belfast’s Crumlin Road area and build the city’s second "peace line." A senior Scotland Yard detective flies to Belfast to follow up gun-running investigations. Hours later 3,000 troops dramatically swoop on the Lower Falls area in an arms search, and I.R.A. terrorists launch a full-scale gun battle on them. A military curfew is clamped down as at least three people die, — two of them snipers claimed to have ‘been shot by Army marksmen — scores are injured and hundreds are detained while the troops relentlessly carry out house-to-house searches. Among the terrifying arsenal ferried out by the truckload through the Army security net which closes the largely Roman Catholic area off are sub-machine guns, one believed to be of Russian origin, rifles, carbines and self-loading pistols. Some of the weapons are found hidden in a sewer while others are thrown out of house windows in panic as the soldiers comb the area. The trouble begins when troops searching a house in Balkan Street, one of a maze of streets between the Falls and Grosvenor Roads, find an arms cache consisting of 15 pistols, a rifle, a submachine gun and ammunition. A mob begins stoning the troops. Soon a full-scale riot is going on and within minutes stones, bottles and home-made plastic and gelignite bombs are being hurled at the soldiers. The rioters hijack buses and drive them across street entrances to form barricades. Pneumatic drills and an excavator are used to dig up the road. Nineteen soldiers and one policeman are injured as vicious volleys of bullets zip up side streets. Elsewhere in the city more injuries as diversionary explosions damage the newspaper offices of the "News Letter," two petrol stations, a savings bank and a parochial house. Saturday. July 4 — By 5 am. the Army reports they are in complete control of the curfew-blanketed area — part of the constituency represented at Westminster by Republican Labour M.P. Gerry Fitt and at Stormont by Northern Ireland Labour member Paddy Devlin. The ban on movement is lifted for two hours in the evening to allow housewives to buy fresh food supplies. Later Army headquarters announce that the curfew will be lifted the next morning "for an indefinite period" so that people can go to church. But the military emphasise that the relaxation does not mean a major withdrawal from the area. And Sir Arthur Young, Chief Constable of the Royal Ulster Constabulary, makes it clear in a statement that in extreme circumstances, such as imminent danger to life, firearms will be available to the police, as in the rest of the United Kingdom. when all other efforts have failed . By Sunday, July 5, hopes were rising that the air had been cleared and that normality and the better life might return to the city that had suffered so much fear and misery. The London "Sunday Times" said in a leading article: "It cannot be pretended that the Roman Catholic catalogue of just grievances any longer constitutes the immediate cause of disorder." The "Sunday Mirror" said: "What everyone has feared is now coming to pass. British troops are having to shoot it out with the gunmen of the I.R.A. "But how many Roman Catholics can be killed before the Dublin Government finds it impossible to restrain any longer the Southern hotheads who are for armed intervention across the border?" Monday’s "News Letter" leader declared: "The lid has been taken off. The Falls district of Belfast has been exposed as a hideout for the gunmen and a refuge for the rioter. "Whatever interpretation may be advanced to gloss the overwhelming evidence that has been collected, the facts stand out with brutal clarity. The world, as last, has seen the truth. "The arsenal that has been built up was not to defend innocent people against the terror of an unarmed police force or a disbanded Special Constabulary. It was stored in defiance of the law, in defiance of authority, to keep Belfast in a state of turmoil and terror with the overthrow of the State as the ultimate objective." And the "Belfast Telegraph" said on its front page: "A Republican stronghold has been flushed out . . . and a potential threat to peace removed." The first — and hopefully decisive — round in Premier Major Chichester-Clark’s pledge to wipe out terrorism had been won. Shown above is a picture of the Alverno Hotel, Springfield Road, Belfast, whose owner refused to give bottles to a mob of Roman Catholic youths, and had the building burned down — as shown below. The hotel, owned by Mr. James E. McLoughlin, aged 50, was the result of 14 years hard work and he saw it burnt and plundered as he stood by helpless to do anything. Mr. McLoughlin, himself a Roman Catholic came from Eire to start his business in the early 1950s. The hotel is in a mainly Roman Catholic area. Mr. McLoughlin said a mob of about 80 arrived and demanded that he give them bottles for use as missiles. He refused and the crowd started bombarding the hotel, smashing first the front doors and then the windows. Before long they had set the building ablaze with petrol bombs. Then the looting started as the mob invaded the two bars and the rooms, and started carrying out the contents. At the close of May, 1970, the leaders of the Roman Catholic, Presbyterian, Anglican and Methodist Churches in Northern Ireland issued a joint statement declaring that recent conflict in Northern Ireland is not religious in its origin, but political and social. Of the various political causes which underline the troubles of Northern Ireland, the most important is the simple fact that people in an adjacent foreign country seek constantly to interfere by physical force in the life of Northern Ireland and have been pursuing or promoting this kind of interference now for half a century. The method which these people have always used is based upon the experiences of the very early 1920’s when the leaders of Sinn Fein snatched political victory from a situation in which they had reduced all southern Ireland to chaos and anarchy, broken down government and communications, and produced fear and insecurity throughout wide areas of the country. Their successors have been led by this ‘memory to believe that if they can now similarly keep Northern Ireland in a state of uproar and confusion, break down any form of government there, set creed against creed and district against district, they can in some way gain for themselves an ultimate advantage from it. This broad plan of attack favoured ‘by Irish republicans depends for its success not only upon raising up in Northern Ireland inflammatory and extremist personalities and movements on the republican side ‘but also upon evoking extremist tendencies in opposition to the republican cause. In this effort to ‘disintegrate Northern Ireland, any supposedly "loyalist" gunman or advocate of violence or of extreme measures is as serviceable to the subversive republican cause as is his I.R.A. opposite number. Anything, from whatever quarter that makes people angry, anything that lowers confidence and increases fear, anything that excites in anybody a sense of grievance and resentment, is useful to those who want to break down peaceful democratic life, halt economic progress and destroy decent neighbourly existence in Northern Ireland. So highly prepared, so sophisticated and so well armed was this campaign against Ulster that the Northern Ireland government in August, 1969, asked the United Kingdom government for military aid. All that has since happened has shown that this was the right course and that any other would have been disastrous. In giving that aid at once, the United Kingdom government came to agreement with the Northern ‘Ireland government as to the long-term strategy to be adopted to defeat disruption and restore peace and prosperity to the province. 1. First there has been a systematic programme of reforms and administrative adjustments to ensure that the ground is taken away from under any kind of social or religious grievance, real or imaginary, upon which disruptive forces could work. This programme has ‘been put into operation with great rapidity, all the more easily since there has proved to be very little that has called for reform, and some of the changes had already ‘been under discussion. This programme of change has already included the appointment of a parliamentary commissioner to deal with complaints and a commissioner for complaints raised at local government or other levels, the issuing and general adoption of an equitable points scheme for housing allocation by local authorities, franchise changes which remove the few differences which had existed ‘between the voting system in Northern Ireland and that in ‘Britain, the formation of a Ministry of Community Relations and of an independent Community Relations Commission, the publication of plans and proposals for a long-intended reorganisation of local government and for a central housing authority, the civilianisation and enlargement of the police force and the replacement of the special constabulary by an Ulster Defence Regiment of the British Army. These changes are to ensure that anything upon which the disintegrative efforts of our enemies could effectively work is removed from our public life. They are also to make it more than ever clear, to people in the province, in Britain or in the world at large, that Northern Ireland is a place where there is constant vigilance to give justice and equal opportunity to everybody, and to show that those parliamentary and other institutions in the province, which express overwhelming support for Northern Ireland’s existing constitution, do accurately and freely reflect public opinion. 2. Secondly, the long-term strategy for peace in Ulster involves long-term planning and capital investment on an enormous scale for the development of the province in industry and all forms of production, in transport, town-planning, housing and all those amenities which make for a prosperous, happy and civilised life. This has always been a central objective of the Northern Ireland Government, and the latest step towards it has been the issuing of a further five-year development plan, financially underwritten by the United Kingdom Government. 3. Thirdly, there has been the steady effort to re-establish fully normal law and order and to contain any actual violence. The army and police have pursued this task in a steady, quiet and undramatic way. Popular emotion would naturally like something sweeping and dramatic in this field, and is very adversely critical where there are failures, particularly when people in some areas are not afforded adequate protection. But there are, in particular, two considerations which are always in the minds of those responsible for security. One is that the province cannot go on indefinitely being patrolled by the army, and that all army containment operations have therefore to be conducted so far as possible on lines which in time can merge easily into ordinary civil police work. The other consideration is that when the more dramatic sort of action is to be taken it is often necessary to wait until the situation is ripe for it. A good example of this was afforded by the extremely successful arms search in the lower Falls district of Belfast early in July, 1970. It had long been known in a good deal of detail that arms were there; but only when information had become fairly complete as the result of police work in London and elsewhere, and when the mounting volume of arms had become substantial, did the Army move in for this operation. A premature arms search could have disastrously defeated its own long-term object. The strategy, then, which is being followed to re-establish peace in Ulster is based on deep foundations rather than on any spectacular but self-defeating devices. It is based on long-term considerations and on a clear appreciation of the methods and motives of those who are trying to destroy Northern Ireland. It is a strategy that appeals to the moderation, the Christian conscience and the sober self-interest and common sense of a community which contains far more wise and decent people than neurotic hot-heads. "I am convinced that the violence was originated by disciplined subversive elements working to overthrow the State." Public expenditure reaching a total of £2,400 million, an increase of £15 million a year on expenditure already projected — this is what Northern Ireland’s development programme for the next five years means to the people of the Province. The plan ‘has the backing of the new Conservative Government and the Ulster Premier, Major Chichester Clark, emphasised in a statement, "Without this support we could not hope to plan on such ambitious lines. In return all that is asked of us is that we should play our part as a community, both in backing this programme with our work and effort. and in maintaining here in all respects the high standards of justice and equality which go with British citizenship." HELP FOR INDUSTRY — The 50 per cent grant for expenditure on plant machinery and ‘buildings for a new and expanding industry will be replaced by a range of grants from 45 per cent to 60 per cent depending on location and employment offered. Maximum rate will be reserved for projects offering worth-while employment in areas of high unemployment, particularly in the west and south-east. More generous loans for industry tailored to requirements and more favourable where the return in employment is high in relation to the capital cost of the project. To stimulate and assist creation of employment through local initiative there will be a new organisation based on the Ministry of Commerce with specific responsibility for seeking out and encouraging local development and enterprise likely to provide jobs. TRAINING SCHEMES — The Government will assist the NI. committee of the I.C.T.U. to sponsor a programme of development and training for union officials and shop stewards at general industry and company level in addition to what is being done and financed by the unions themselves. The need for more trained managers in key functions including personnel and industrial relations to be examined. MORE HOMES — Completion of 75,000 houses in the next five years. The speed of slum clearance schemes will relate closely to the willingness of some of the families in the redevelopment areas to move elsewhere. Government is to set up a Central Mobility Office and will give generous financial encouragement incentives to encourage movement throughout Northern Ireland. Possibility of widening existing schemes of preserving existing dwellings which can still have a useful life to be explored and encouragement given to the improvement of the environment in what may be called "improvement areas. Powers to be provided for the central housing organisation to sell its houses to any tenants who wish to buy and mortgage arrangements to be offered. GROWTH CENTRES — Londonderry and Ballymena to be centres of accelerated industrial growth with eight key centres — Newry, the Coleraine triangle, Lame, Dungannon, Omagh, Enniskillen, Strabane and Downpatrick. In the Greater Belfast area some specific adjustments of the Matthew stopline for public authority housing and industry together with overspill arrangements to facilitate movement to Craigavon, Antrim and the inner growth centres of Bangor, Newtownards and Carrickfergus. Ministry of Commerce to take into public ownership sites at Mossley, Ballymacross and Knockm’ore. At Glengormley a large site to be acquired to make further provision for the needs of existing industry requiring new location within the urban area. TRANSPORT — Present railway system to be given an opportunity to show whether it can provide attractive services at reasonable rates. A special study of Belfast port has been carried out and there will be similar review of other ports. ROADS — The need to concentrate on the strategic links between the main growth areas and on Belfast-Aldergrove fully accepted construction earlier than planned of the section of the M2 between Glengormley and Templepatrick to be examined. The period 1970-75 will see Phase One of the Belfast urban motorway under construction. TOURISM — Amenity areas to be provided, including a Lagan Valley country park, a country park in the hills on the Antrim side of Belfast and the coastal path between Holywood and Bangor. About 2,500 men drawn from the more difficult employment areas to be used in direct labour schemes to improve the appearance of town and country. Expenditure on tourist facilities to be increased by £500,000. year. SCHOOLS — The raising of the school leaving age to 16 in 1972-73 will create a need for new schools and it is the Government’s intention that it will be met. Priority to be given to the provision of social and recreational facilities in the major urban areas of Belfast and Londonderry. HOSPITALS — Capital expenditure on hospitals to be increased ‘from the present level of £22.25m. to £22.5m. Average rate of capital expenditure to rise from the present £4.25m. a year to £4.5m. WELFARE — Capital expenditure on health and welfare will be £29m. during 1970-75 which should at least keep Ulster abreast of rising standards in the U.K.
"Evidence collated by the security forces proves almost conclusively that the shooting which accompanied the riots was another phase in a detailed plan by a faction of the I.R.A. to prevent the Orange marches taking place on July 13." His report said, "It has now been established by police forensic experts that the city centre fires which broke out simultaneously at the height of the rioting were all caused by devices of the same type — probably manufactured by the same expert. "They employed a simple, highly-effective timing mechanism based on the ordinary wooden and wire spring clothes peg. This type of device, which can be packed into a parcel about the size of a half-pound box of chocolates, uses weed-killer chemical as ‘the main incendiary material, a small electric battery and a length of fuse-wire. Two drawing-pins are inserted into "mouth" of a clothes peg to complete an electric circuit when closed. "It now seems probable that some Army unit commanders may have been outwitted on Saturday by a diversionary plan which indicates that the I.R.A. have a skilful military commander here in Belfast. "Troops were concentrated initially in the Ballymurphy and Crumlin road areas of the city, where the first troubles broke out, and the Ballymacarrett district of East Belfast, where the most serious shooting eventually took place, was in fact left unguarded for more than an hour." The military force which had to try to restore control was a hastily assembled mixed unit with a Marine Commando major in command of the sub-units from an infantry battalion. Other evidence of the preparedness of the I.R.A. continues to mount. Reports of I.R.A. men ‘being seen in uniform — dark-green battledress and berets — are reaching the police and are being taken seriously. "It is now known that at ‘least two well-prepared casualty clearing stations were set up in advance of Saturday’s events. "Information from sound sources of the arms held in certain Catholic districts is alarming, to say the ‘least of it. "A number of highly sophisticated, modern weapons were identified ‘by experts who saw and heard them in action on Saturday. It was a different story, but again involving the I.R.A., according to the "Irish Times" report of the gun battle involving British troops in the Falls Road area on the night of Friday-Saturday, July 3-4. "The battle arose when a diversionary tactic went astray, a leader of the Provisionals, the Northern I.R.A. group, said. "The battle," he added, "had been a great mistake." "Efforts were made to divert the Army from three places — a house in Balkan Street, another house, and a warehouse — which they had approached directly in the knowledge that they contained arms. But after some stone-throwing," said the Provisional leader, things had got out of control. There had been too much gunfire, and the result was the capture of many of the arms in the area. "In a frank interview in a comfortable estate house on a hill overlooking Belfast, the republican leader said that resistance to the Army on Friday night had been weakened by the divisions in the movement and lack of proper communication. "We didn’t know they had so many arms in the Lower Falls, he said. We knew nothing about them. The main republican group there are ‘official’ and there has been some ill-feeling. "If we had all been together, this would never have happened; Diversionary action would have been taken by units all over the North. "By about midnight, when we saw the battle getting serious, there was little we could do as the Army had the place surrounded. "A unit of the Provisionals from Andersonstown did, he said, attempt to draw off troops at about 3.30 a.m. by blowing up a savings bank. Two soldiers who came out were injured when the republican unit opened fire. But they only sent several hundred troops out. "There were plenty of Provisionals in the Falls on Friday night of their own initiative. Officially there were no units of ours there. They did it off their own bat. "It was all very disorganised, and I don’t think there was a plan of action, said the Provisional leader. "He said contingency plans were being made to prevent a similar capture of arms in other Catholic areas of the city. In Ardoyne, he alleged, the Army had sealed the whole area off with barricades, so there was no escape. It was a form of trap. "‘Our only wish now is to get a breathing space, to regroup and calm down. We are outnumbered and outarmed. and we don’t want to sacrifice any more than we have already.’"
An R.U.C. 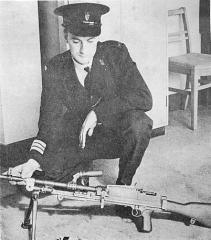 Sergeant with a Bren gun and ammunition captured by troops in Belfast on July 11, 1970 — part of an I.R.A. haul made in a raid on Gough Barracks, Armagh, in 1954. "The type of armour found — out of date guns and so on — was nothing to make anybody fear for the security of the State." Dr. Patrick Hillery, Eire Minister for External Affairs, in a statement in Dublin after his secret visit to the Falls Road on July 6. "A total of 20,750 rounds of ammunition were recovered in this search in the Lower Falls area. The weapon tally was — 52 pistols, 35 rifles, 14 shotguns, six automatic weapons, 25 lbs. of explosives, 100 incendiary devices and grenades." "The weaponry was frightenly sophisticated. A large part of the 21,000 rounds of ammunition found was 9 mm., which fits Sten guns." Ulster’s hopes and prayers for a peaceful "Twelfth of July" celebration were fulfilled — despite I.R.A. plans to disrupt it. On Monday, July 13, more than 100,000 Orangemen paraded to 19 centres in a dignified and disciplined demonstration of their loyalty. And the record crowds who lined the routes and thronged the rallying points provided in themselves the answer to Northern Ireland’s enemies. The Rev. Martin Smyth, Grand Master of the County Grand Lodge of Belfast, commented afterwards: "In 30 years of going to Finaghy I have never experienced such a warm welcome for the procession from the people of Belfast. "The crowds were all good-humoured and were a fair cross-section of the public. They cheered us all the way to Finaghy and all the way back again. "Special Branch detectives have uncovered a plot to infiltrate the massive Orange Order parades in Belfast today. "They believe that members of an illegal organisation, wearing fake collarettes, planned to join the parades and create incidents. "The conspiracy was smashed on Saturday night when detectives raided the home of a Roman Catholic in the city and discovered a number of fake Orange Order sashes." After the parades Captain L. P. S. Orr, M.P. for South Down at Westminster and Imperial Grand Master of the Orange Order, said: "As head of the Order I am very proud of my brother Orangemen. They have been subjected to a sustained attempt to turn our great annual celebration into an occasion for bitterness and disorder. "They have met this provocation with dignity and restraint. Our Roman Catholic neighbours and friends have shown the same common sense and we acknowledge this. "We are grateful also to our security forces — a great day indeed for Ulster." Twenty-four hours earlier the "Sunday News" had published a tribute from the Deputy Chief Constable, Mr. Graham Shilling-ton, to the degree of co-operation the police had received from Orangemen throughout the Province who had voluntarily agreed to the re-routing of several marches in the interests of peace. He particularly mentioned Pomeroy, where the local lodges had decided not to go through Lucy Street and Fairhill areas. "This was typical of the general gestures towards peace," he said. Within hours of the Army’s successful — and highly revealing — swoop on the ‘Falls a poison Campaign was mounted against the troops. It was the mixture as before, with the soldiers accused of the same kind of "atrocities" R.U.C. men had faced only a year earlier — brutality, looting, vandalism and theft. But it was a smear campaign that backfired in the faces of Gerry Fitt, Paddy Devlin and others who supported it. The Army immediately called their bluff by saying the charges would be investigated, setting up complaints centres. . . and then expressing surprise at the small number of people who came forward. And this time the world was wiser. Several commentators contrasted the loud accusations of Fitt, Devlin and even the Dublin Government with their strange silence on the arms find and their failure to condemn the actions of the gunmen who shot it out with the Army. The London "Daily Telegraph" said in a leader on Tuesday, July 7: "It was wholly predictable that within a few hours of the completion of its action in the Lower Falls area of Belfast last Friday the Army should have been stridently accused of brutality and looting... What matters politically, however, is that most of those who have raised the old hue-and-cry about looting and beating-up have done so in the hope of dissuading the Army from conducting similar operations in future. The searches must go on." And the "Daily Express" said: "The Army deserves the highest praise for its patience in face of constant provocation. Those who denigrate the soldiers will find no support among the British people."